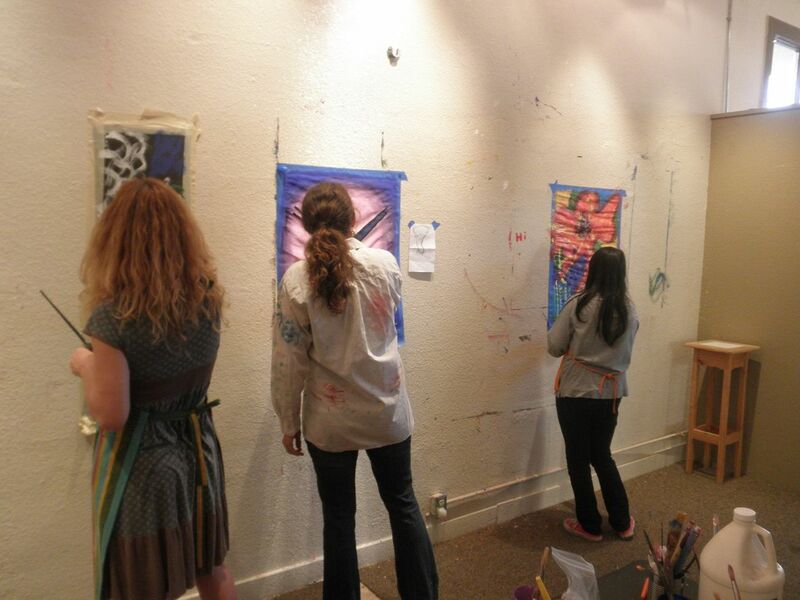 Wednesdays, 6:00 – 7:30 p.m.
Let the music move you to play with color and shape and get your creative juices moving! When you work fast there is less time for the critic to jump in! No experience needed, you set your own pace. It is all about the process, not the end product! And, as a painter, I will pass along my knowledge to you in ways that will help you experiment and explore so you can learn to paint in an intuitive way, following what feels good so you find your own personal style. This easy class will help you release stress from your day, get messy if you want, even throw paint while the music keeps your mind still and your creativity moving. The more you come the better you get at letting go and playing! Wear comfortable clothes that you don’t mind getting messy. There are aprons and paint shirts available. No previous art or painting experience necessary. You do not need to know what to paint. I will get you started! Paint to Music, an on-going experiment with following the music and our pleasures to arrive somewhere unexpected! Play with paint with others, you don’t have to make art alone! Honoring what we did and what our challenges and woohoo moments were. Once upon a time the Paint Room was WHITE! 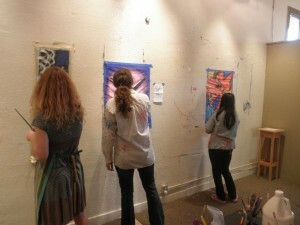 Our group “clean off the brushes” painting at the end of class. Pretty fabulous!